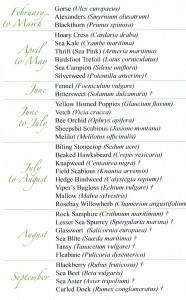 The following are just some of the flowers that can be found along the Bay if you look hard enough. The drawings and text are extracted from a beautifully illustrated book by Friends of Stokes Bay members Felicity Anderson and Wendy Osborne. 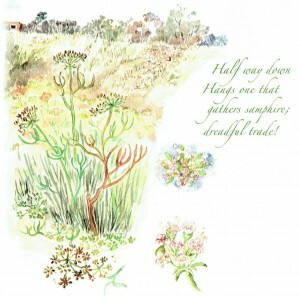 It can be bought from the Friends, details are on our Publications Page. One of the first green plants to appear, Alexanders is rampant down the railway line and along the path from Fort Road to Gilkicker where it tries to crowd out all other plants. 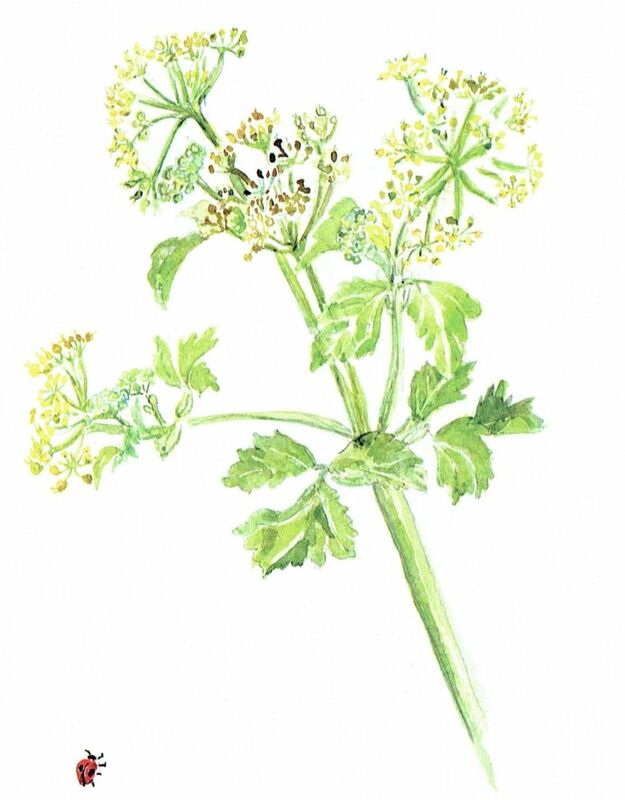 Originally a Mediterranean plant known as `Alexandria Parsley’, it was introduced into this country by the Romans for its culinary and medicinal qualities which is why it is often found at the site of old monasteries. The flowers, stalks and roots were often eaten as potage until the eighteenth century when it was supplanted by celery. Alexanders is prevalent along our coasts. 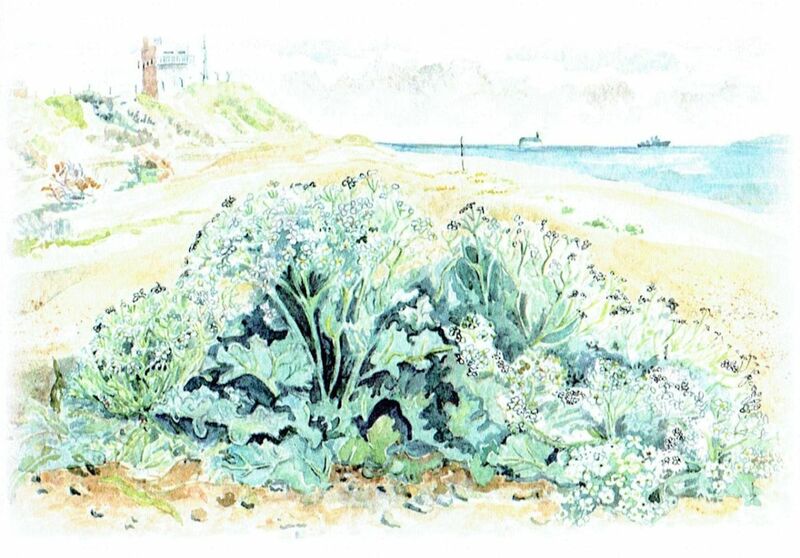 In late May and early June clumps of grey-green Sea Kale proliferate along the crown of the shingle at Stokes Bay. The first leaves of a young plant are a vivid purple; they get greener as the plant gets older. Sea Kale does not usually flower until it is about 5 years old — if you are lucky you may see its large flower heads of clusters of tiny white florets. 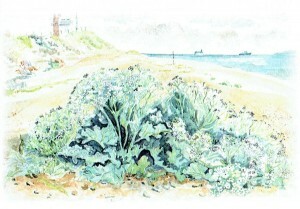 Sea Kale is protected under the Wildlife & Countryside Act (1981). Sea Campion blooms amid the thrift in June and rambles over the shingle between the Angling Club and Gilkicker. It grows to about 15cm (6 in), forming loose mats of foliage and small white flowers. The flowers are about 2cm (¾in), with petals that are deeply notched and spring from a calyx which is delicately striped; it should be viewed with a magnifier. 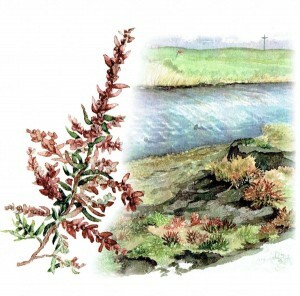 This plant can be found rambling over the shingle between the Angling Club and Fort Gilkicker. 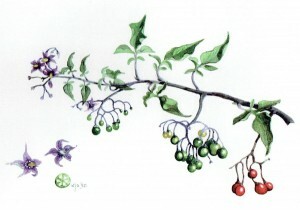 It is sometimes incorrectly called Deadly Nightshade; although it is from the same family, it is not as poisonous as the larger variety. In late summer it produces attractive deep purple flowers with a centre of yellow pointed anthers; the fruit is a tiny scarlet tomato-shaped berry from which the plant gets its name. If you taste the berry it will at first be so bitter that you will spit it out; but the after-taste is curiously sweet. `Solanum’ is derived from the same Latin root word as ‘solace’. 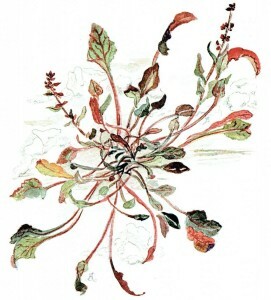 Bitter­sweet probably got this name because of its many medicinal uses: it was used to treat asthma, bronchitis, jaundice, kidney problems, rheumatism, skin diseases, and to counteract witchcraft. These delicate yellow flowers are happily proliferating eastwards along the shingle from the level of the Alverbank Hotel. 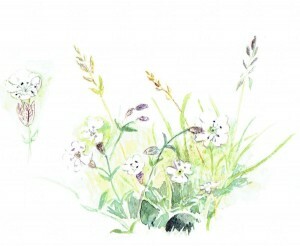 Their lobed, twisting leaves are a challenge to paint — so too the petals which blow away in the wind. The seed-pods (or ‘horns’) curl and grow up to 40cm (1½ft) in length and are said to be the longest seed-capsule of any British plant. The grey-green leaves are covered with fine short hairs, which protect the leaf surface from the salty conditions in which it lives. 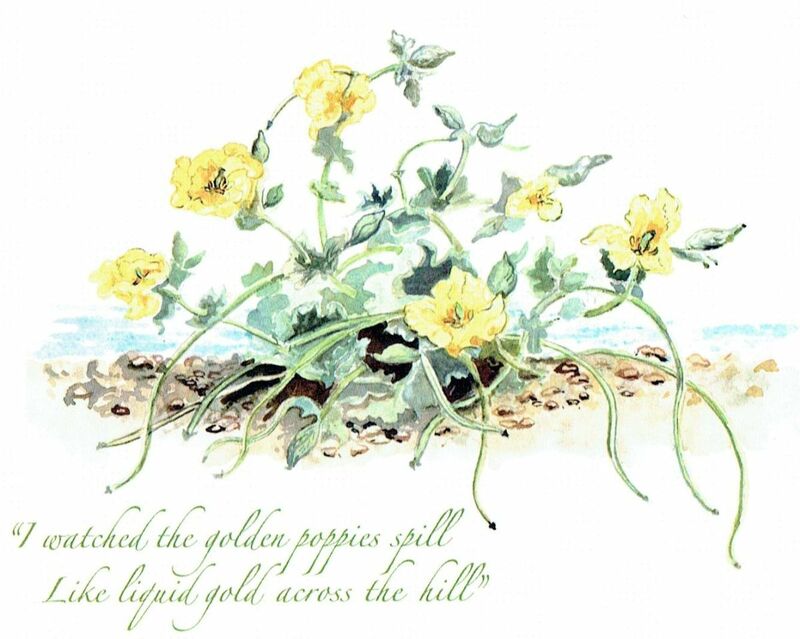 Being generally restricted to shingle, the Yellow Horned Poppy is a rare plant and is protected under the Wildlife & Countryside Act (1981). This is one of our special gems and should be seen through a magnifier in early July when they are at their best. Many hundreds of these tiny mauve flowers cover the dells between Fort Gilkicker and Fort Monckton. The narrow-lobed flowers mass in globes 1cm in diameter in which the outside flower circles open first. The short, thick anthers are united at the base. The flowers fade quickly but if you are lucky to find them in their prime, look closely and you will see the delicate pink stamens. 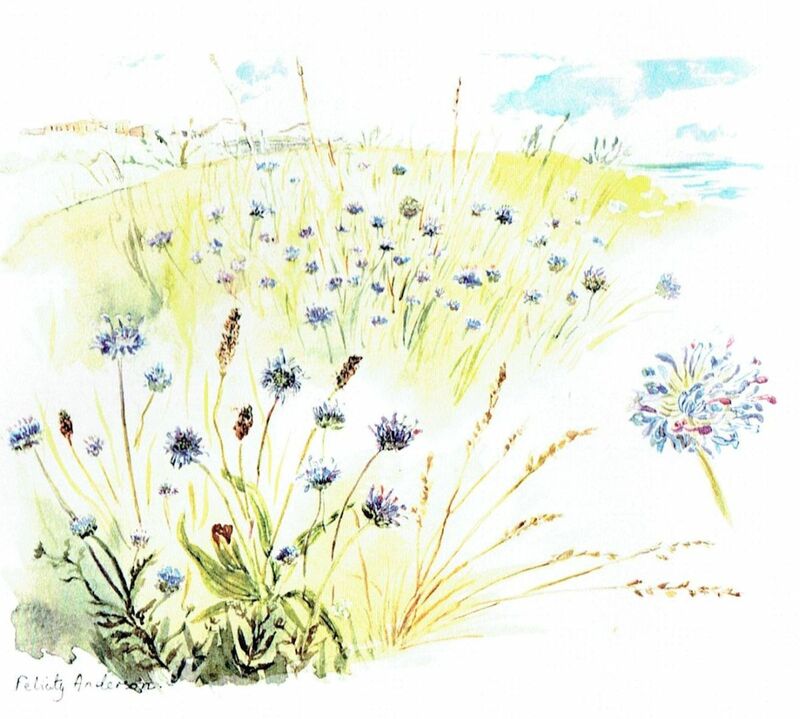 From June to September these tall scabious bloom on the banks of the toilet behind GAFIRS. 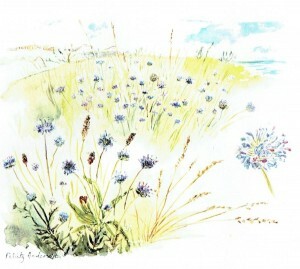 Their delicate blue, rounded, pincushion flowerheads form on tall, hairy, branched flower stalks and blow in the wind. 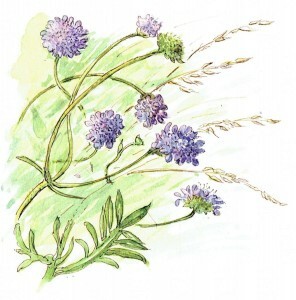 It is because of the shape and colour of the flower that it is sometimes called Ladies’ Pincushion or Blue Button. The nectar from the flowers attracts numerous insects including bees, butterflies, moths and hover flies. 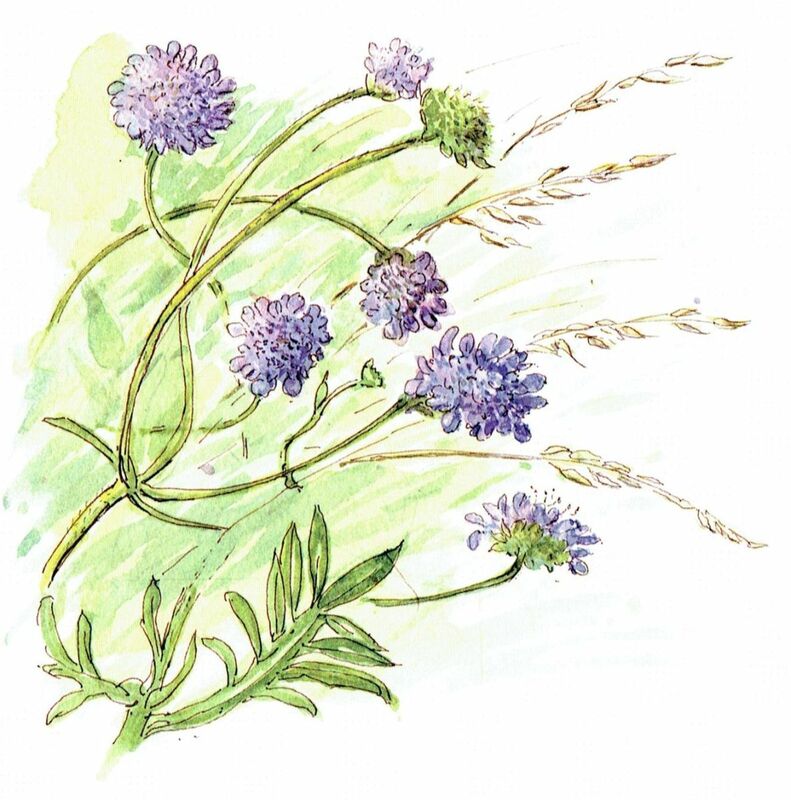 The name ‘scabious’ comes from the once-held belief that the juice of the plant could cure scabies and other skin diseases. 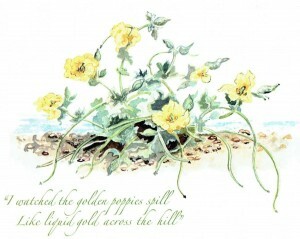 This greenish-yellow plant grows in clusters by the path to Gilkicker and in profusion, out of the cracks in the granite wall between Gilkicker and Monckton. This is an edible plant which used to be taken up to London in casks of brine to make Victorian pickles; wholesalers would pay up to four shillings a bushel! Demand was such that Samphire collectors would go to extreme lengths and often lose their lives while trying to collect it from precarious cliff-face sites. 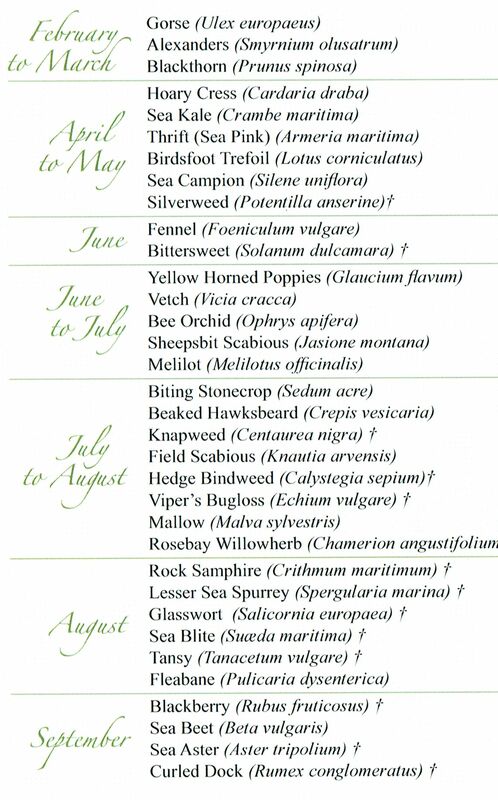 Because it is a plant of the stony foreshore, Rock Samphire is known by several other sea-related names including Sea Fennel, Crest Marine, Sea Asparagus and St. Peter’s Herb. `Samphire’ derives from ‘St Pierre’, the patron saint of fishermen, also known as The Rock. 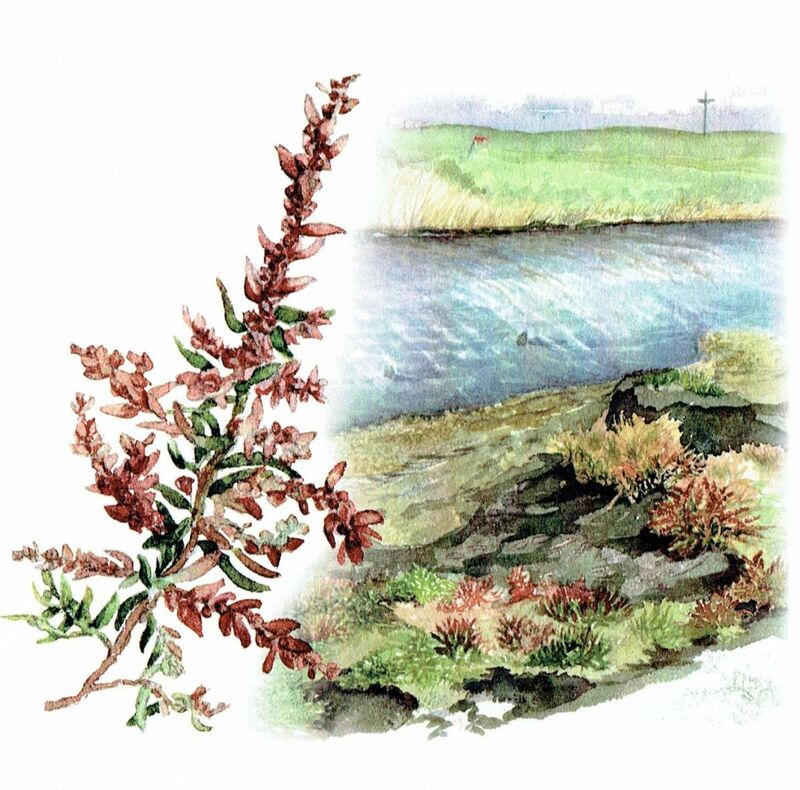 Sea Blite is an annual herb commonly found on seashores, in saltmarsh, mud, sand and sometimes below the tideline. It can be found on the south east bank of the Gilkicker lagoons. It has fleshy, semi-cylindrical leaves, 1-2 mm wide. Its flowers are minute, only 1-2 mm in diameter and can be found in the axils of the upper leaves from August to October. Each tiny, green, button-like flower has five green triangular sepals, no petals, and five pale yellow stamens. The plant forms small clumps which vary from yellowish green to reddish. In the autumn the perennial Sea Beet sprawls over the shingle adding a deep crimson colour over the pebbles. 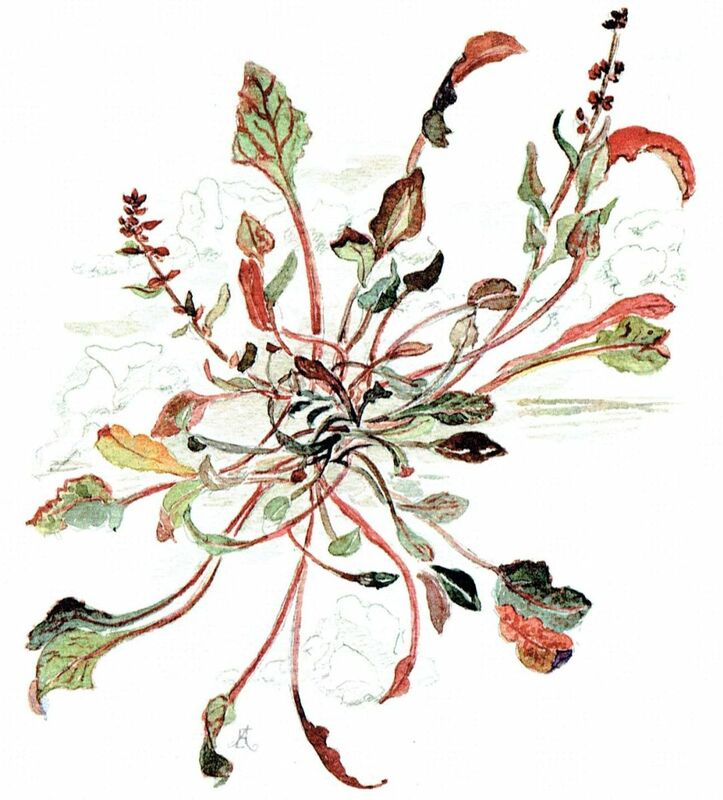 It is the wild ancestor of common vegetables such as beetroot, sugar beet, and Swiss chard. The flowers are produced in dense spikes; the green or reddish-tinged blooms are very small, only 3-5mm (V4-1/8 in) diameter; the fruits form a cluster of hard nutlets. For details of how to purchase a copy please visit our Publications Page.